There are very few grammar points that I know so well as conditional sentences. Students always ask about them and they appear in tests and students. I have tried many times to explain this grammar, but I feel that I have always failed. I have created about 5 different presentations and three mind maps till I got to this simple one. 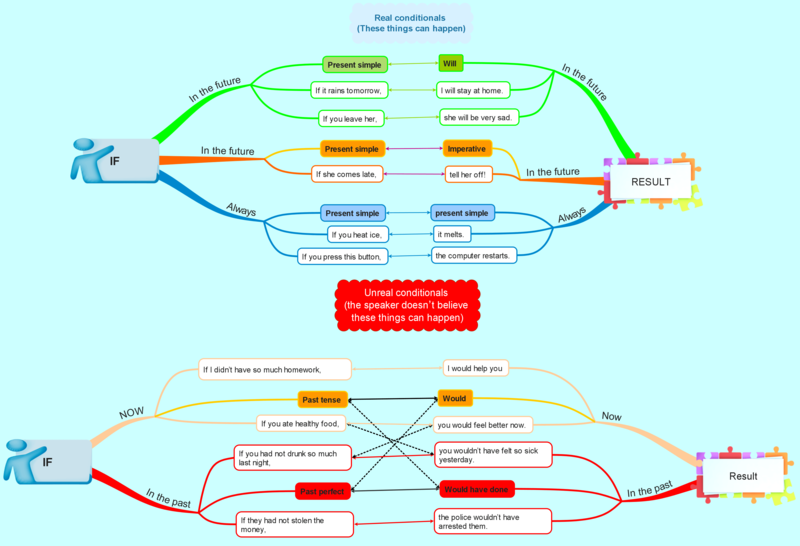 This is the simplest mind map I have managed to create and students say it is fine and they can understand it now. I hope it works the same way for you. Read the map from the left side. The two arrows in the midle of the map show that the RESULT part can be at the beginning and the IF part at the end. The horrible mess in the middle of the Unreal conditionals, shows the mixed conditionals, where the IF in the past can have a RESULT NOW. Or where IF now can have a RESULT in the past. I hope you understand. It is very important to understand the grammar rules, but it is even more important to be able to use them correctly. You can try this out in the following games. The first one is called On Target and your task is to answer the questions and shoot all the BAD ducks. You can get a bonus if you shoot one of the bottles. The second game is a new one. It is called darts. You should choose the correct answer but then WAIT and click it only at the moment you aim at a high number. It is not as easy as it seems. You can leave your score at the comments section and the winner will get ELM magazine from us. Do you think we do a good job here? Please go to our Facebook site and like us. Thank you. I find this exercise really good for my students, hope to share it with them and have some fun. It is good exercise in simple way.So please share me incoming new exercises. Thank you for sharing this useful and hard subject! It’s a very informative game. I have learnt from my mistakes. This is very good for me. That is the best way to learn. Keep on learning!! Great Effort! I keep coming back to your website! I got 105 in the dart game. Conditional sentences is a challenge for my CAE course. Yes, they are. Students often go crazy when I say the word conditional. I hope that the mind map will help them at least a bit. You can share the content with whoever you like, as long as you do not claim that you have created it. I would really appreciate a link to this site, though. Love your lessons so much – such a great teaching tool when trying to engage teenage students! Only problem, the conditionals darts game seems to have a glitch in it – it seems to get stuck in the same loop of questions for a while, before moving on. Otherwise – perfect! !